I've been thinking about this for a few months now, ever since I learned that drawing is not necessarily a talent that you're born with. As naive as it may sound, I didn't realize that I can actually pick up a pencil and paper and learn how to draw. True, a lot of people have the creative flair, an eye for it if you may and I'm sure it's easier for some people and not so easy for others. 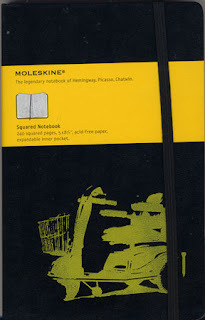 Last week, I finally decided to buy myself a moleskine sketch book. I've only used one page so far, drawing circles. Eventually I will be confident enough to actually show you a page or two from my moleskine.